Business kicked off in ’s-Hertogenbosch, the small Dutch city about an hour by train south of Amsterdam known to its close friends as Den Bosch (pronounced “boss”, just to confuse). It’s an attractive place, capital of North Brabant, meandering tiny old streets, veined with small canals called the Binnendieze, meaning “the Dieze river within [the city walls]”, and it has a spectacular gothic cathedral. Its best-known son is the late 15th century painter of fantastic visions Hieronymous Bosch, and figures from Bosch’s paintings appear as street (and canal) art around Den Bosch. My evening in the city began with a small disappointment: the guidebook reported that a classic Dutch “brown cafe”, the unpretentious style of local drinking venue that is the local equivalent of the corner pub, would be found in a street by the cathedral, and I was eager for the experience. Unfortunately when I arrived the music being played over the PA was loud, bad sub-rap. I’m generally musically tolerant, but this was vile. 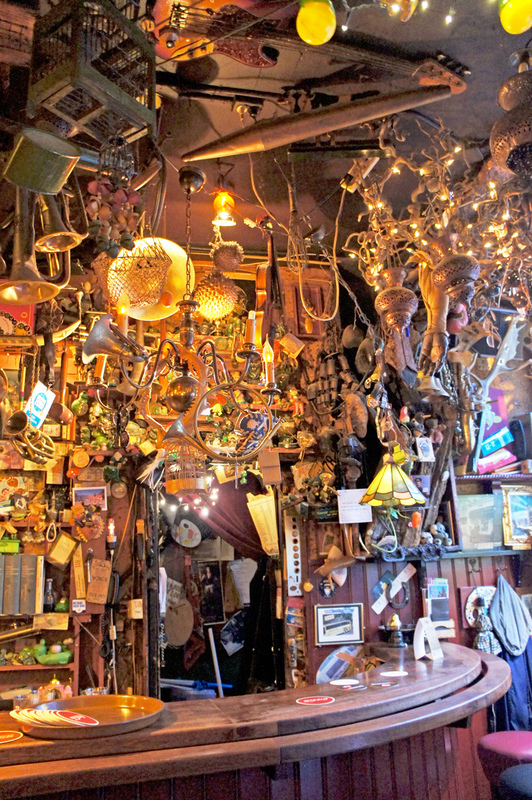 However, on the way back to the main bar area in Den Bosch I was captured by ’t Bonte Palet (“the colourful palette”), supposedly the smallest bar in town, whose interior design philosophy is most usefully described as “huge explosion in an over-crowded junk shop”. I have seen British pubs attempt the “insane collector” look, but none came close to the heights ’t Bonte Palet achieves, with the ceiling and walls hardly visible under a thick impasto of almost anything you can think of that can be stuck to a ceiling or a wall: roadsigns, clocks, wooden toys, guitars, chandeliers, framed medallions, dried fish, helmets, old horse tack … it swept aside the brown cafe disappointment. Thursday morning, a dozen or so conference delegates (a fair few of whom I knew already: the beer writing scene is small and friendly) took a coach to Koningshoeven, home of the Trappist abbey where La Trappe beers are brewed. 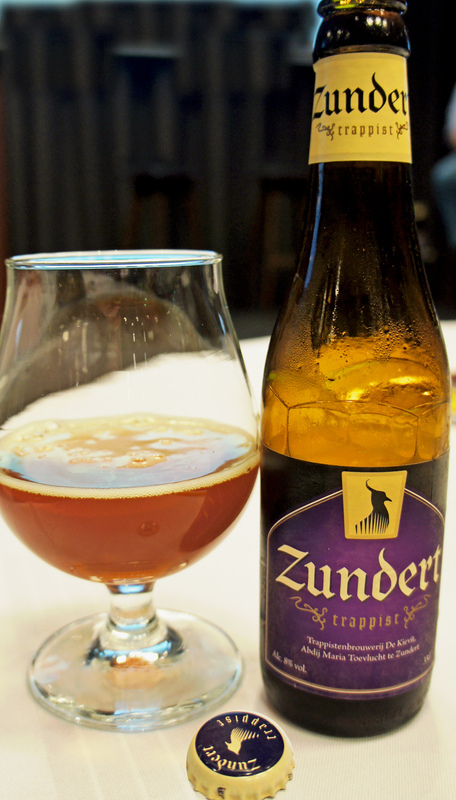 Unlike most Trappist breweries, the one at the Koeningshoeven abbey doesn’t use its own name for its beers, but that of the original Trappist abbey at La Trappe in Northern France. 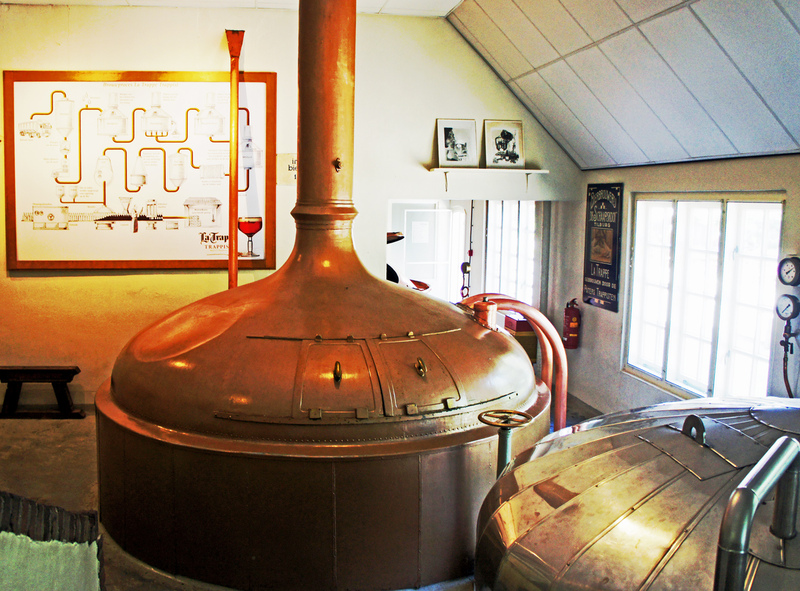 It is also controversial in that the brewery at the abbey, founded in 1884, has been operated since 1999 by a company called De Koeningshoeven NV, a subsidiary of Bavaria, the local big brewer (and second largest in the Netherlands after Heineken). 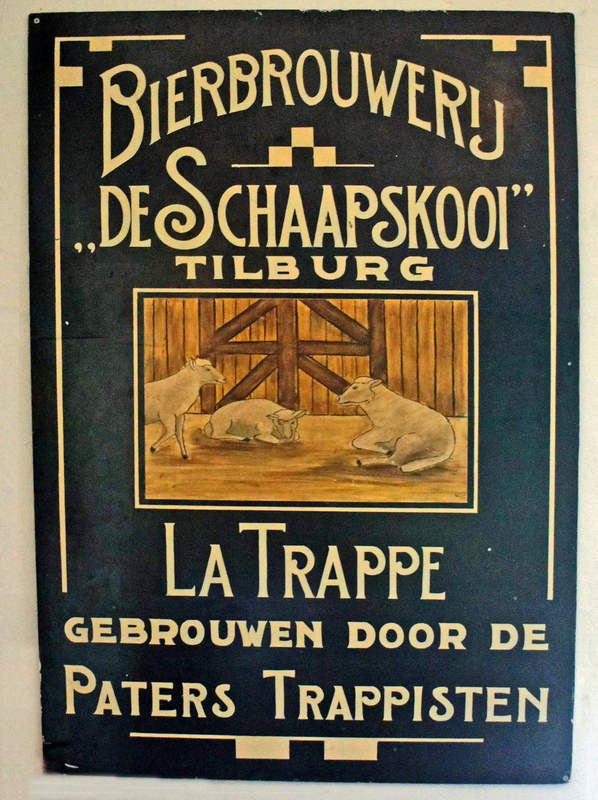 After the Bavaria deal the International Trappist Association took away La Trappe’s right to use the “authentic Trappist product” logo on its beers, only restoring the right in 2005 when the monks at Koningshoeven agreed to take a more active part in the beers’ production. I didn’t see a single monk during our time at Koningshoeven, though the tour round the brewery was interesting enough: the old copper vessels in use until the brewery was modernised in 1989 are still in place, with the newer stainless steel kit next door, and Christ staring down on the brewers. I was also amused that in the new brewery, and the bottling hall, the windows are gothic arches … La Trappe is about the only “Trappist” brewery happy to experiment, inventing the “Quadrupel” style and making the first Trappist wheat beer, Witte Trappist. Like other Dutch wheat beers, this is drier than its Belgian counterpart, though still with spices and citrus, and after my first encounter at Konigshoeven I’d be very happy to drink it again. From the abbey we travelled (some took bikes – not me, sore feet) to another old-established brewery site that has been revived, in the village of Oirschot. The De Kroon brewery was built in 1773, but had its roots in the 17th century, and when it, too, fell into the hands of Bavaria in 1999 it was one of the oldest family breweries in the Netherlands. 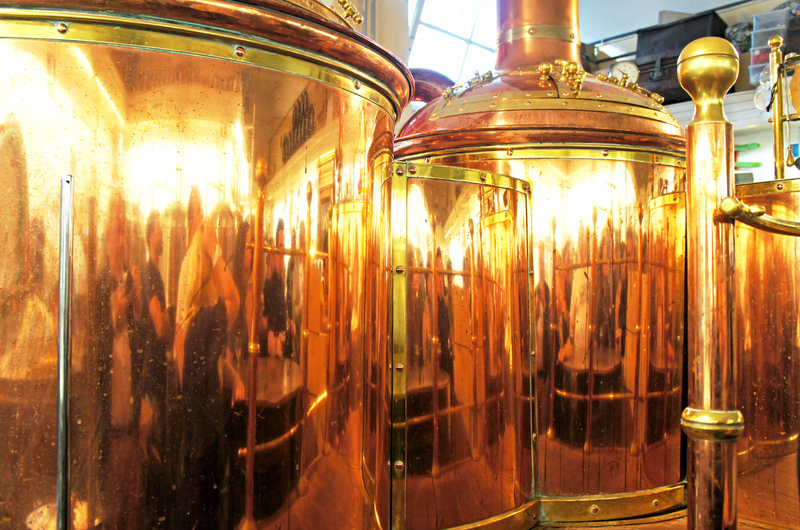 Bavaria closed the brewery in 2002, but the former managing director, Gerard de Kroon, whose ancestor Cornelis Dieliszoon de Croon had married into the brewery in the 18th century, kept it running as a small brewing operation incorporating a rather messy museum, with old kit collected from other closed Dutch breweries dumped around the brewery yard. In 2015, however, if I’m remembering what we were told properly (foolishly I wasn’t taking notes) an entire new set of shiny stainless steel brewing equipment was installed at the brewery, together with a tasting room and hipstery cafe, and a new operation started producing beer under the name Brouwereij van de Oirsprong, a play on the name of the village and the Dutch word “oorsprong”, meaning “origin” or “source” (the same word in German is “Urquell”, as in … well, you get the allusion) under brewmaster Harrie Vermeer, whose career previously had included stints at Amstel, La Trappe, Texel and the Amsterdam cafe-brewery De Bekeerde Suster. Vermeer gets round the need to produce something pale, cold and 5 per cent for the average punter by brewing a “Zwickel” – “It’s not really a Zwickel”, our guide admitted, but it’s unfiltered and tasty, about as close to a pils as the brewery makes, and very welcome on a hot day. I was more impressed with the Hop-Wit, a 5.6 per cent dry-hopped witbier: who knew dry-hopped witbiers were even a style? 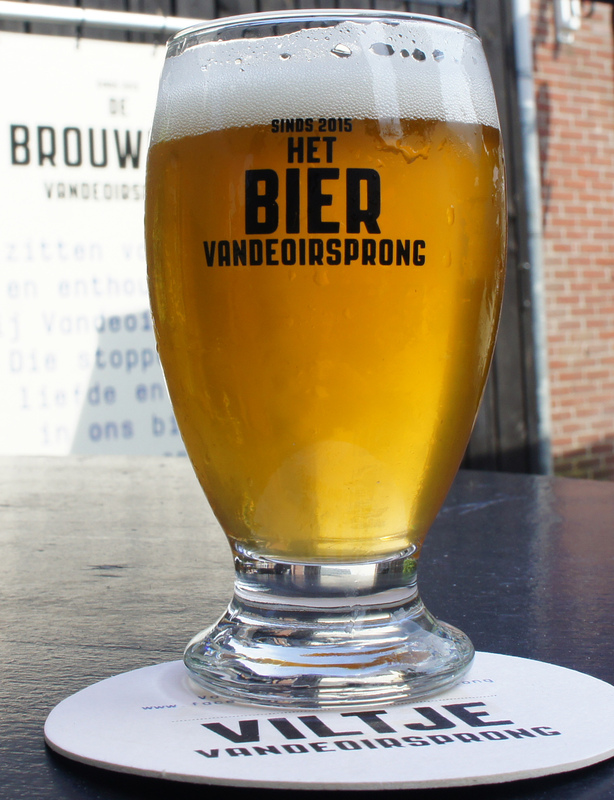 But they are, and one that needs to be more widely brewed, if they can all be as good as van de Oirsprong’s, since the extra depth from the dry-hopping very satisfactorily balances the spices and orange. 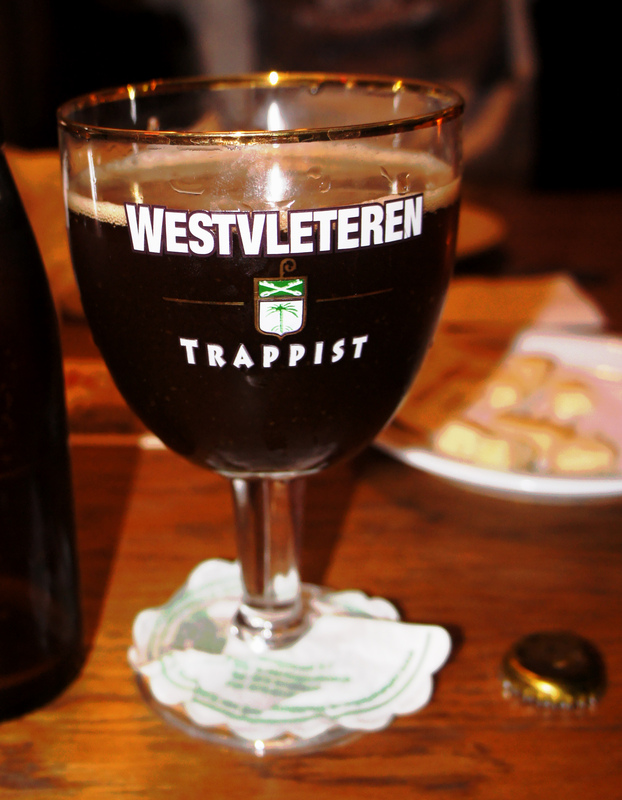 As well as the ’t Kolleke brews, Café Bar le Duc (named for the duke who himself named ’s-Hertogenbosch, “Duke’s Wood”) also sells other people’s beers, including Westvleteren, rarest of Trappist brews, available, officially, only in single cases from the Abbey of Saint Sixtus in Vleteren, Flanders, and regularly voted “best beer in the world” on sites such as ratebeer. It was €19 a 33cl bottle, but I had never drunk it, and did not know when I might see the chance again. I’ve had the beers brewers by the monastery’s former commercial partner under the St Sixtus name, and they are certainly very good, so it appeared worth the punt. Alack, apart from the “tick”, it wasn’t: liquoricey, dark, and not even the best beer I’d had that day. The next day was the start of the conference proper, at the Mercure hotel on the edge of Amsterdam. Among the first speakers was Shanna Holthaus, marketing manager for Mercure in the Benelux region. Mercure in Belgium and the Netherlands has decided that beer tourism is a big strong horse it should definitely be hitching its wagon to: last year almost every Dutch Mercure was linked to a local brewery, and beers by the local brewers are actively sold in the hotels, in the bar and restaurant. The Mercure I was staying in (in the centre canal district of Amsterdam – a booking mistake on my part, but it was actually considerably nicer than the conference hotel and gave me the chance to wander round the lovely, tree-plastered canal district for an hour on a quiet, sunny Saturday morning) sold craft beers from De Prael in the lobby, and had a craft beer bar called Arthur’s, which tickled me, since Arthur is my middle name. If you’re part of a big hotel chain, finding ways to differentiate your individual hotels by linking them into something specifically local like a nearby craft brewer is an excellent way to make guests feel they’re getting more than the standard corporate experience. Other hotel groups please copy. Dale Smith of FlavorActiV then subjected us to a beer flavour faults workshop: I always squirm at these exams, because I find there are some faults I pick out very easily – I’m very sensitive to diacetyl – and others I flounder with. DMS, for example, I struggle to spot, and rather than the classic “sweetcorn”, I mumble “honey?” Right after Dale, it was the beer bloggers’ equivalent of speed dating, as ten different Dutch brewers, including ‘t IJ, De Prael, Oedipus, Kees and Emelisse, had five minutes per table of bloggers to take us through one of their beers. This was fun, if unfair on everybody, and I can only remember a few of the beers: there was a pineapple Gose, I believe, not anything like as bad as it sounds. The best bit was watching the faces of the guys from ’t IJ as Tim Webb, author of the World Atlas of Beer, among other books, lambasted them for the deeply sexist branding on their IPA labels, with a cartoon big-busted nearly naked woman. It was clear they had no idea at all what his problem was. Dinner Friday night was on Jopen: I have admired the operation for more than two decades, since it resurrected Koyt, a beer brewed with sweet gale to a recipe that will be 610 years old next year. We travelled to Jopen’s new facility on the Waarderpolder industrial estate in Haarlem in antique motor buses not quite that old, but certainly older than most of the delegates. It would have been a better experience had it not been pouring a gale, which made it hard to see out the windows for passengers and drivers. Fortunately it had stopped raining when we got to Waarderpolder, as the excellent food was served mostly from stalls set up outside in front of the unit that houses the new brewery, and when it started again there was a large bar upstairs. Then, like the most modish dinner party, it was away to a second venue for the dessert course, the Jopenkerk, the big church converted by Jopen into a brewery, restaurant and bar. Dessert was three beer and food pairings: Imperial Oatmeal Milk Stout with chocolate and hazelnut tart; Koyt with “bieramisu”; and fruit bread and goat’s cheese with Extra Stout. The only one that didn’t work was the last: the cheese smothered the stout too much. There was meant to be a pub crawl round Amsterdam afterwards, but the rain meant the streets were still almost as wet as the canals, and I was meant to be speaking in the morning, so I headed for the pillows. Tim Webb was Saturday’s first speaker, delivering a typically passionate and articulate sermon on the continuing threat to diversity posed by the ever-bigger global brewers. Then it was me, revealing a few facts about the history of pale ale people would not have heard before (and which you’ll read here, eventually). The highlight of the day, though, and the presentation I most wanted to hear, was by Willem van Waesberghe, Heineken’s “global craft and brew master”, talking about Heineken’s H41 project: brewing a lager with Saccharomyces eubayanus, the only recently discovered “other parent” of lager yeast, Saccharomyces pastorianus. S eubayanus, a rare cold-loving yeast, was first found in Argentina in 2011, and since then in a few other places, including Tibet and Wisconsin, but not yet in Europe, making it a mystery how it ended up in a Bavarian brewer’s cellar, where all the evidence is that several hundred years ago it hooked up with ordinary top-fermenting brewer’s yeast, S cerevisiae, to give birth to a new strain of yeast that would tolerate the cold and still brew beer efficiently. Van Waesberghe suggested a few clues as to how and why it happened the way it did, and I shall be writing more on this frankly fascinating subject here. The beer Heineken made was itself very interesting: S eubayanus cannot ferment certain sugars that S cerevisiae can, so to end up with a 5 per cent beer like its “normal” Heineken lager, the brewer had to start with a stronger wort, which meant the final product was darker and slightly sweeter than “normal” Heineken. Much more later. 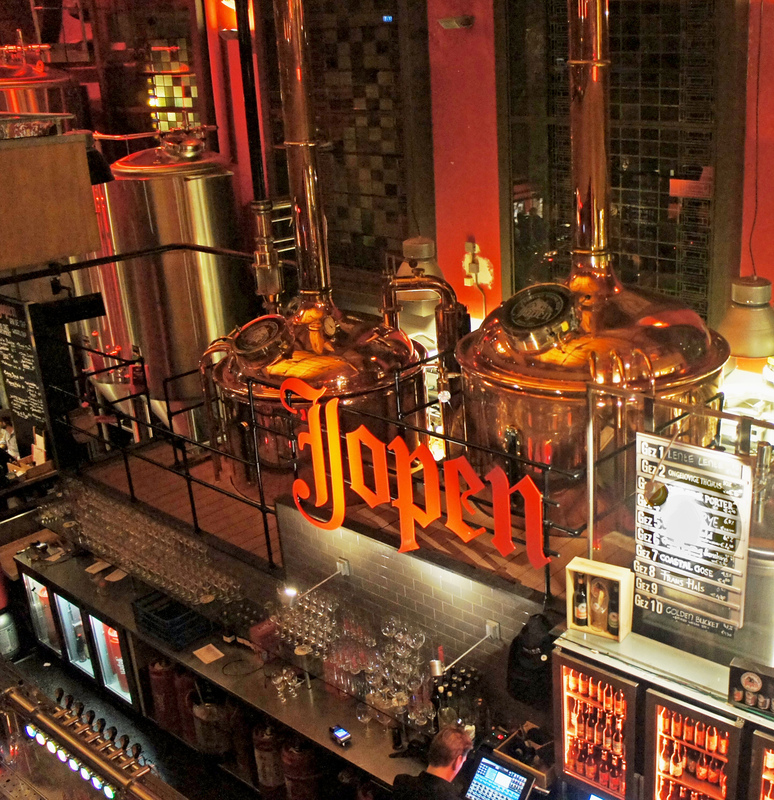 ’T Ij brewery and bar, Amsterdam: too hip to hop? Sunday the plan was to book out of the hotel, find the left-luggage at Amsterdam Centraal, dump the suitcase for later pick-up and catch the train for Bodegraven, in South Holland, home to the De Molen brewery. The other delegates on the trip were mean to be getting on the train at the station after Centraal: it took me so long to locate left-luggage I literally leapt through the door into the last carriage of the train to Bodegraven seconds before departure, so I sat panting for half an hour and surprised them by suddenly appearing on the platform at the station where we all had to change trains. 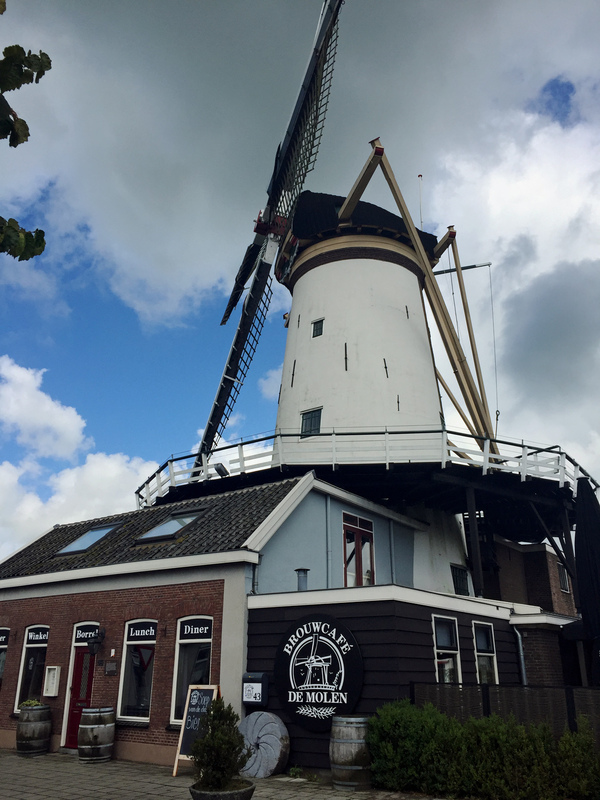 De Molen started in 2004 as a tiny operation in (as you would expect from the name) an old mill. 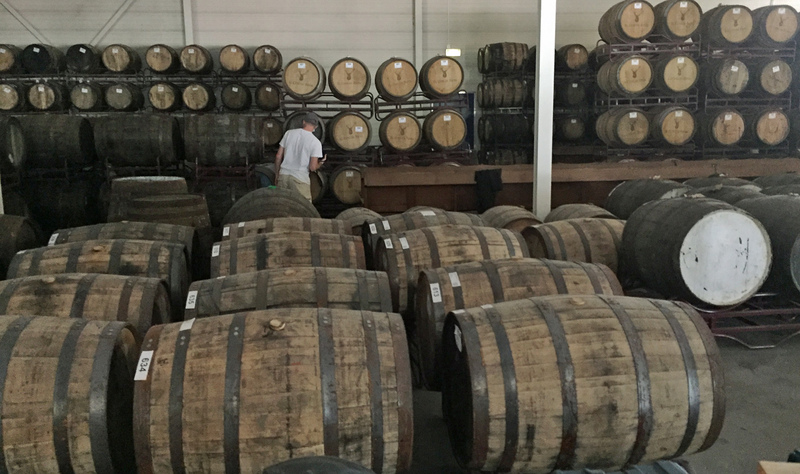 Since then it, too, has expanded into an industrial unit, not least to cope storing with the huge number of casks, from ex-Rioja barrels to ex-Scotch and ex-Bourbon barrels, it is filling with beer and letting slumber in the dark. 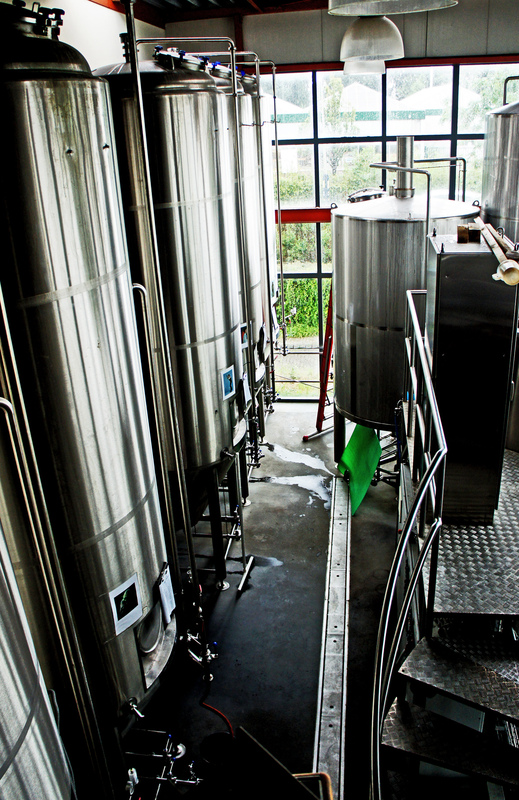 However, the old kit is still in place in the mill, and used to make small-batch beers. 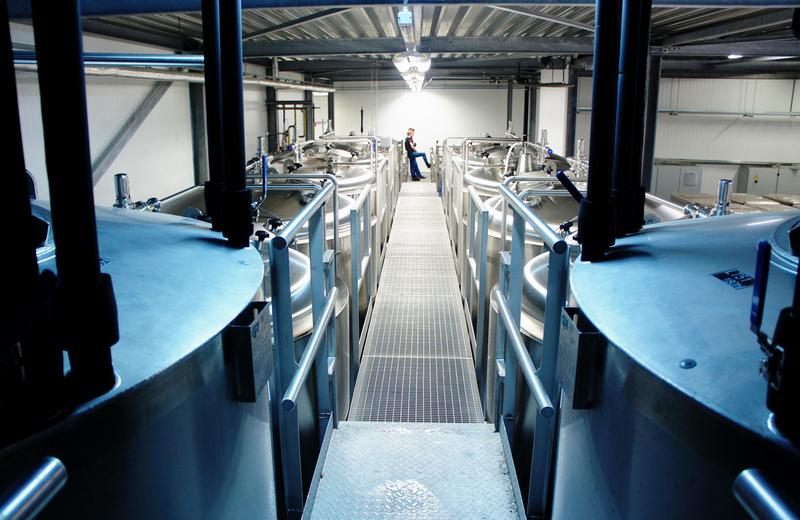 This has, of course, taken money, and earlier this year it was revealed that Bavaria – them again – now owned 35 per cent of the company, having brought out the small investors who funded De Molen when it started. The mill is now home to a small restaurant and bar, and a beer shop as well, and, as usual, the food was as excellent as the beers. Tell me if I’m wrong, but this “great food with great beer” idea is not something British craft brewers have grasped. They need to. (Incidentally, while the beers are fine, I loathe De Molen’s plain black-and-white labels: possibly because I find them hard to parse. Over at the new brewery, some 300 yards’ walk from the mill, they have kept track of all the kit by naming each vessel after a character from Star Wars, with a picture of that character taped to the vessel. What is the Dutch for “There’s a leak in Princess Leia”? Meanwhile I don’t believe I have ever seen a bigger collection of casks outside an actual whisky distillery. Here beers with names such as Hel & Verdoemenis (Hell and Damnation) and Mooi & Meedogenloos (Beautiful and Ruthless) await their public apotheosis: although apparently the local Calvinists throw a Dutch fit if anyone offers them a Hel & Verdoemenis. The was the last year, after, I believe, six, of the EBBC: the organiser, Zephyr Conferences, has done what seems to me an excellent job, but the events have never been cheap and it has never been able to get the attendance that its North American equivalent gets. Next year Zephyr is trying something different: a tie-up with Siba’s BeerX event in Sheffield in March called BeerNow, meant to cater to “breweries, brewery guilds, tourism promotion organisations, tour operators, bloggers, and writers”, with witers and bloggers who attend getting in to many of the BeerX events, which are not normally open to hoi polloi. If it involves the sort of access I enjoyed (enormously) in the Netherland, I very much hope to be along. 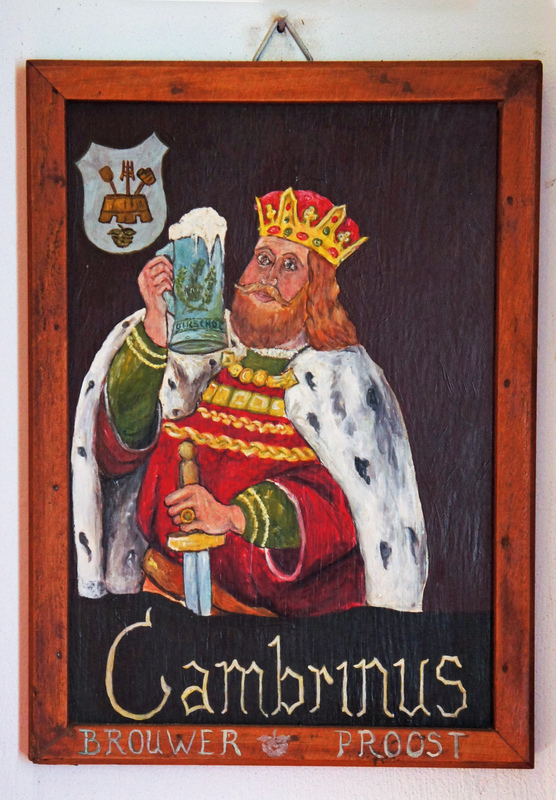 Outside of La Trappe–any suggestions on offerings you would recommend from your travels that would appear in the US? Perhaps I just need to go. I would say the weekend was extraordinarily cheap for the beers we drank, not to mention the content we heard and the great time we had. I’ve always been surprised why more people don’t come. Great to see you enjoyed the Netherlands,Martyn. 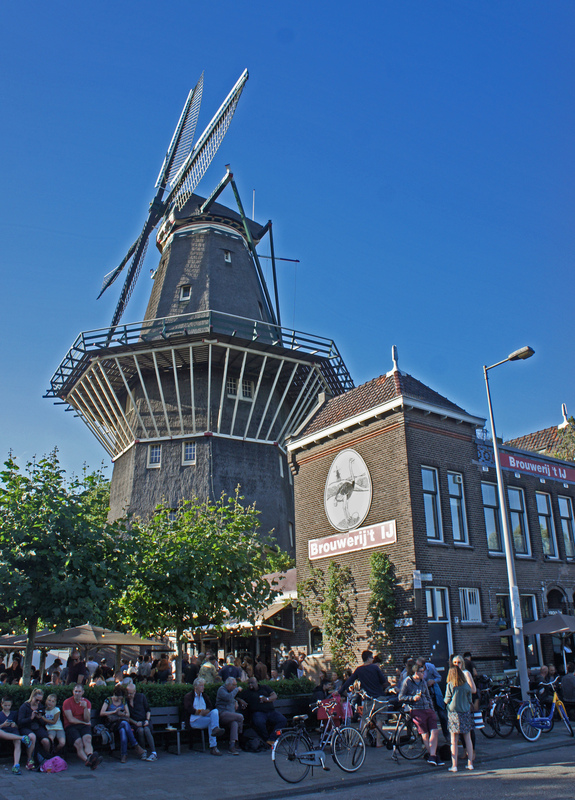 Loved your coverage of Dutch beer and brewing. My parents came to Canada in 1953 but I’ve never shook my Dutch heritage, especially when it comes to beer. Really heartbreaking when I can’t sample someting like “Speculator ” here at home. Will have to brew it myself???? Challenge accepted.